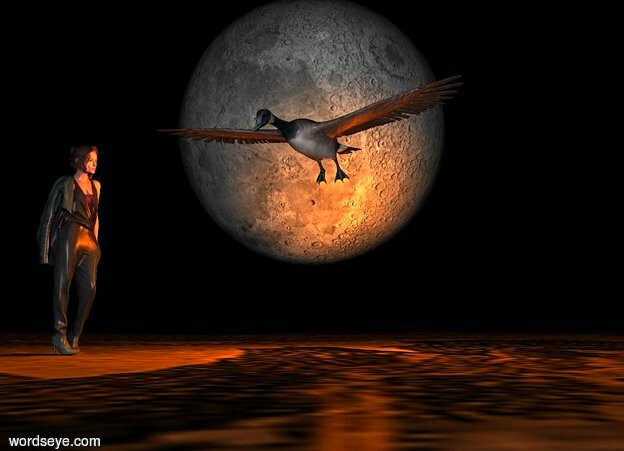 Input text: a 100 inch tall moon.ground is sea.ground is 700 feet tall and 120 feet wide and 100 feet deep.the moon is 30 inch above the ground..it is night.in front of the moon are two orange lights.in front of the moon is a branta.the branta is -120 inch right of the moon.the branta is -100 inch above the moon.the branta is 29 inch tall.the branta is facing southwest.the branta leans 40 degrees to the front.a 60 inch tall woman is on the ground.the woman is facing the branta. as usual it was cloudy didn't see a thing ! nice pic.